Typically, I try to get these annual list posts done before the end of the year, but this time around, life got the best of me, and in the case of the National Register posts, you may recall that longtime MDAH National Register Coordinator Bill Gatlin retired in June 2017, so this year, I had to put together the list myself, which took a minute or two, and I say that with my best whine. Most years, I divide the National Register listings into two posts, one being the individual buildings that were listed and the other being the historic districts. This year, although there were 15 listings, which is about average, only two of them were districts, so I’ve divided the posts chronologically by listing date. There was also a delisting–the evocatively named Valley of the Moon Bridge over the Bayou Pierre in Claiborne County. The 1920s bridge was listed on the National Register in 2005, but was demolished around 2015. 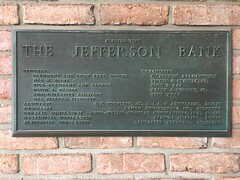 Jackson Street M.B. Church, Vicksburg. Photo by Nancy Bell, August 2016. 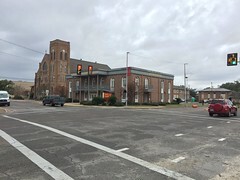 The nomination was written by Nancy H. Bell of the Vicksburg Foundation for Historic Preservation. The church was listed on the National Register on January 11, 2017. Shaw School (1923, N.W. Overstreet, archt.). Photo by Jennifer Baughn, MDAH, 9-23-2015. This campus is significant at the local level for Education, having served as an educational center for the small Delta town of Shaw since 1923. It opened as a school for white students, grades 1-12, but continued as Shaw High School after integration. The administration building and gymnasium are significant at the statewide level for Architecture. The administration building is an important work of N.W. Overstreet’s early career, demonstrating his personal style in its combination of the long horizontal lines, wide eaves, and geometric motifs of the Prairie style with classical ornament and symmetrical massing. The gymnasium, designed by Overstreet & Town and built as a WPA project in 1940, carries on the scale and materials of the administration building but employs highly abstracted ornament on a stripped-down, early Modernist form. The cafeteria (1960, Harold Kaplan, archt.) and football field (c.1940) at the rear contribute to the historic integrity of the campus. Jennifer Baughn and William M. Gatlin of MDAH wrote the nomination. Shaw Consolidated School was listed on the National Register on January 11, 2017. From its opening in 1928 until closing in 1959, this school provided the only education available for African American students, grades 1-8, in the Sherman community that encompassed an area in both Amite and Pike counties. The school building is also significant in the area of Architecture as an example of a standardized Rosenwald Fund design. In 1927, the parents of two one-room black schools–New Zion in Amite County and Flatt in Pike County–came together to build a larger Rosenwald school at a midway point right on the county line. The Julius Rosenwald Fund contributed $700 of the $3,800 project. Donated land and labor totaled $1,500, and the black community held fundraisers yielding another $500, for a total African American donation of $2,000, with the white community donating $1,050 and the public school district contributing only $50. An average of 137 students attended the three-classroom building through the 1950s, but closed due to consolidation in 1959, and most students rode the bus to South Pike High School in Magnolia. 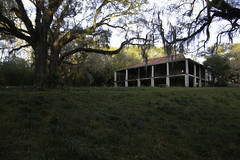 The building saw a new use as a Head Start Center beginning in 1970, but it is now owned and maintained by Sherman M.B. Church. Dr. Jesse Harness, Sherman Line alumnus, and Jennifer Baughn, MDAH Chief Architectural Historian, wrote the nomination. Sherman Line School was listed on the National Register on January 12, 2017. Hillsboro Methodist Church, Scott County. Photo by Jennifer Baughn, MDAH, August 2013. 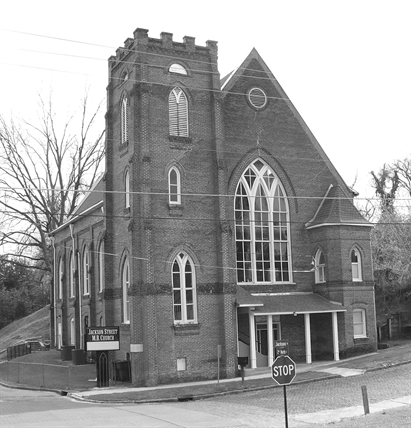 This church was organized in 1836 in a log chapel called Cypress Grove and was later moved to Hillsboro. The three-acre site includes a cemetery containing monuments of six Civil War soldiers and a community bell. The current church building, a wood-frame, Craftsman style building raised on a brick pier foundation, was built in 1928 after the original building was destroyed. Although the congregation is no longer active, the church is architecturally intact and was nominated for its local significance in the area of Architecture. The property is maintained by the Hillsboro Methodist Church Cemetery Association. 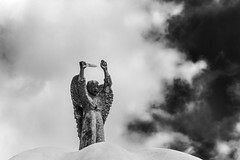 Sammye Jean Webb of the Hillsboro Methodist Church Cemetery Association, wrote the nomination. The church and cemetery were listed on the National Register on June 5, 2017. Street. Prominent African Americans interred at the cemetery include former Mississippi Secretary of State James Hill; Ida Revels Redmond, daughter of Hiram Revels; and Dr. R. L. Johnson, a doctor in Jackson. The cemetery is located on the same block as the historic M. W. Stringer Grand Lodge, the Council of Federated Organizations Building, and Jackson State University. Heather Wilcox, Neighborhood Development Assistant at the Center for University-Based Development, Jackson State University, wrote the nomination. Mt. Olive Cemetery was listed on the National Register on June 5, 2017. Mt. Moriah School, Walthall County. Photo Nov. 2013 by Jennifer Baughn, MDAH. This one-story concrete-block building was built as a grammar school for African American students in rural Walthall County and operated from 1931 until 1959. The school, built of blocks that, according to oral history were molded on site by local men, is a good example of a standardized building plan designed by the Mississippi Department of Education’s School Building Service Division—a state office largely funded by the General Education Board, a philanthropic endeavor of John D. Rockefeller. In 1959, Mt. Moriah School closed after all Walthall County African American schools were consolidated. In the late 1960s, the school became a Head Start Center, operating until 1991. After repairs following Hurricane Katrina, the building now serves as a community center maintained by local alumni and volunteers. Jennifer Baughn, MDAH Chief Architectural Historian, wrote the nomination. Mt. 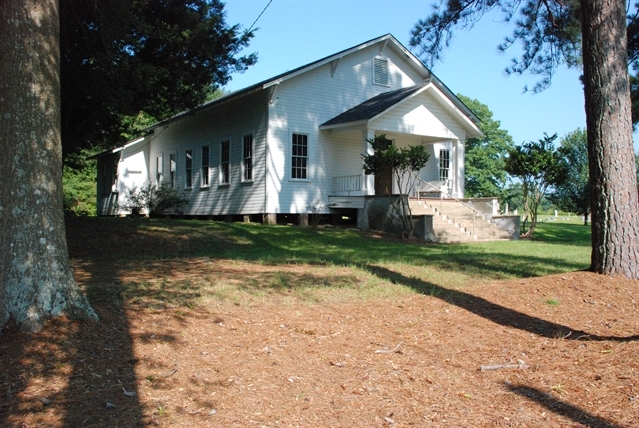 Moriah School was listed on the National Register on June 5, 2017. Ginntown School (Walthall County Training School). Photo March 2011 by C. James, MDAH. level in the area of Architecture as an example of a standardized Rosenwald Fund design. In the 1890s, the Ginns—a family of freedmen who moved to Walthall County after the Civil War—built a two-room grammar school called Ginntown. of the land, while local white residents contributed $800. Upon completion and with proper equipment, the new school was named Walthall County Training School, one of only 12 county training schools in Mississippi in the 1920-21 school year. The Walthall County Training School closed in 1959 after all of the county’s African American schools were consolidated. The building became a Head Start Center in 1966, providing child-care to the community for twenty-three years. 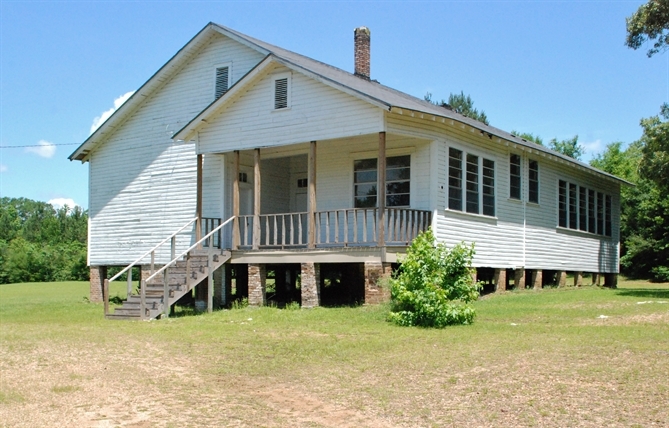 Walthall County Training School is one of fewer than twenty surviving Rosenwald schools in Mississippi. 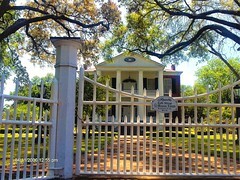 Wharlest and Exlerna Jackson House, Natchez. Photo April 2016 by J. Baughn, MDAH. This one-story, frame house was the home of slain Natchez civil rights activist Wharlest Jackson, Sr. A Korean War veteran, Jackson moved from Chicago to Natchez in 1954 after getting married. The Jacksons had five children; four girls and one boy. Jackson became active in the local chapter of the NAACP while working at the Armstrong Tire and Rubber plant. When co-worker and fellow Natchez NAACP member George Metcalfe was seriously injured after a car bombing in 1965, Jackson helped organize protests. Jackson also openly lobbied his employer to end discriminatory practices—a fight that led to his promotion to a position previously only held by whites. On his way home after finishing his first shift in his new job, Jackson’s truck exploded from a bomb, instantly killing him. 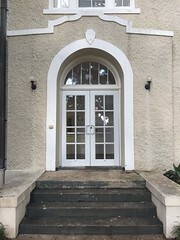 The Wharlest and Exerlena Jackson House is still owned by the Jackson family and serves as a reminder of the violent resistance to the modern civil rights movement in Mississippi. William M. Gatlin, MDAH National Register Coordinator, wrote the nomination. The Jackson House was listed on the National Register on June 5, 2017. Thank you, I’m looking forward to reading each nomination. Each one has such an interesting background.